As related by Bill Gribble, Picton, ON, September 4, 2002. He passed away in August 2017. The boat, a Ted Brewer design, was on the cover on an edition of his book on boat design. The boat was built at Picton Heights, where Hullmaster rented the first hangar on the left that had been a truck repair facility. There was a room in the building that had the air filtered. This is where they created the original molds in a dust free environment. At that time the cost of the fibreglass and epoxy was reasonable so that the builder was generous. The hull was constructed in two halves and made on their side. There was a separate molded piece for the liner, which was all one piece, and then the deck and the cabin was another separate piece. The ballast was a gracefully shaped piece of lead that fitted perfectly inside the keel. When the two sides were put together they were fibreglassed and epoxied together with the lead inside and it fit perfectly. This made for a smooth hull to have the ballast inside. with a weight of 10,4000 pounds and powered by a Farymann Diesel 12 HP. single cylinder that used ¾ of a quart of fuel per hour. The water tank was under the sole in the fin of the keel. The tank for the waste water was built in up forward. The fuel tank had access through the port locker. 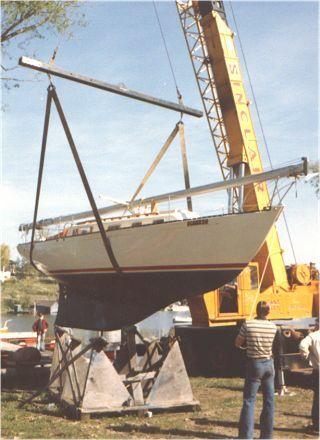 The mast and boom were extra heavy aluminum with an internal track and single spreader. The teak was on the rail, cabin, cockpit sides and taffrail. There was one opening port in the head and the other ports were in the cabin and forward on both sides. There were double life lines and double batteries. The construction was of solid glass laid up (they may have used chopped strand later). The only balsa was in the deck and the cabin overhead. The colour of the deck was sand (optional choice) and the hull was white. She had wheel steering (opt.) and rigged for a spinnaker. The engine controls were on the steering post. The normal complement of sail: storm jib, working jib, main and genoa (120%) originals made by Genco of Toronto. Later Bill put a fully battened main and a Hood working jib. The boat sailed well in heavy weather with the storm jib only. 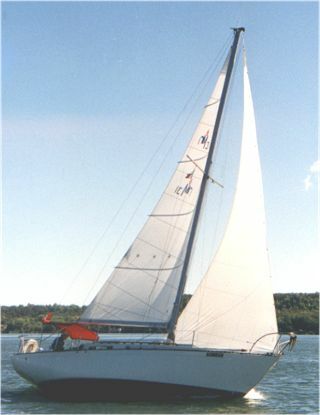 Sailing qualities: She was sea kindly and never had green water on the deck even in the Lake Ontario storms. The ratio of ballast made her not too stiff. Her speed was 6.5 knots on a reach or a beat. Downwind sailing, she was steady with the long keel but could turn easily because of the cutaway. She held a course very well and in a light breeze would do 3 knots with a genoa and full main close hauled making her own wind. In storms of about 30 knots with a reefed main and storm jib she would sail to windward. She was easy on the helm and well balanced. There was full standing headroom throughout, a large icebox and a hanging locker for foul weather gear. You could sleep five but three was more comfortable. An alcohol stove in the galley. The instruments were EMS depth meter, knot meter and odometer were optional. The current owner now has electronics with computer, GPS and electronic charting. An Autohelm 3000 on the wheel for single-handing was very good. The lazarette under the cockpit seat held the lifejackets. Hullmaster : Roy Brooks was president and his son Ron was the financial officer and vice president. They had between fifteen and twenty people employed and did good teak work. Previously the company had built smaller boats north of Belleville. They also subcontracted with a Nova Scotia company and built the Minuet a 18' day sailor and a 21' day sailor on the lines of the Bluenose that had a fixed keel. The company went bankrupt four years after they contracted with Brewer to do a 27' design. They spent a lot of time on the mold of the new design. The cabin mold was the same as the larger boat because the design just shortened the transom. They added a cutout ahead of the rudder that was the design of the times, although not significant to the performance. There are still some Hullmaster 22' in the harbor that are good day sailors and have an optional drop keel (George Smith of Villeneuve has one). When the company went bankrupt the molds were sold to a Barrie company who sold the unfinished boats as kits, so that there were some privately made boats. Alan Scott Nye was working at that time in Bloomfield building the Alberg 29's and 22's.